University of Santo Tomas volleyball player EJ Laure took to her social media account to shoot down pregnancy rumors. 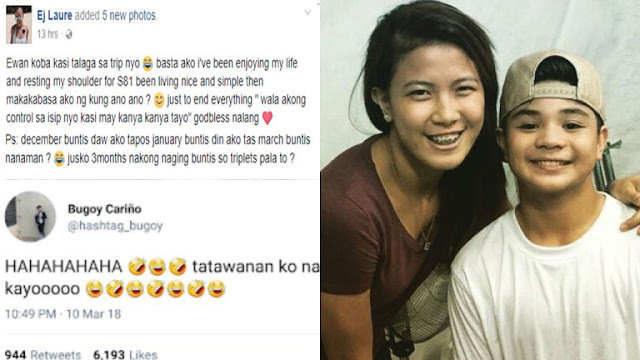 In her post, the 19-year-old star spiker denied that she was impregnated by her 15-year-old boyfriend Bugoy Carino. "Ewan koba kasi talaga sa trip nyo basta ako i've been enjoying my life and resting my shoulder for S81 been living nice and simple then makakabasa ako ng kung ano ano ? just to end everything " wala akong control sa isip nyo kasi may kanya kanya tayo" godbless nalang." EJ posted. "Ps: december buntis daw ako tapos january buntis din ako tas march buntis nanaman ? Jusko 3months nakong naging buntis so triplets pala to ?" she added. The former child star, on the other hand, just laughed it off, writing: "HAHAHAHAHA. Tatawanan ko nalang kayo."